A long time ago, aka a couple years, Social Media had no relevance to your page rank or SEO campaign. Social Media was simply another tool, or middleman to connect your business with your clients. Usually links to social media were rel= nofollowed (tell search robots to not click on link). Up until a few years ago, social websites media sites were not considered as high quality links and did not carry much authority. As of today, the number of Facebook and Twitter users exceed 500 Million! If this isn’t a reason to give a website authority, then I quit this industry. Google and Bing realized that there is quality in Facebook and Twitter and have said they can directly impact you page rank. Fret not friends, your quest for more followers and to get Gaga to retweet you can actually pay off. Twitter, while some still call it a ‘new’ phenomenon, it is crucial for successful business today. It has been one of the best (and free) tools you can use for reputation management. You can directly contact your customers using @ and #, showing that you are a company that cares. However, there wasn’t much SEO benefit to having thousands of followers, or having your tweets actively retweeted. This makes no sense because the quality of follwers, number of followers, and numbers of retweets/mentions directly emulates link building and link juice. Thank the SEO Gods that now it does. While Google and Bing haven’t released a clear cut SEO checklist, here’s a few suggestions they obviously take into account. Quantity of Followers: From a link building perspective, more is better. The number of followers you have will affect where you are ranked. The more followers link your sources and articles the higher page rank you will receive from the bots. Quality of Followers: Also much like link building, the quality of your followers (or links) matters. If you have NY Times linking to your website, this is a high quality link and you can potentially fly up the page rank. This concept applies to Twitter. If you have high authority authors following you and linking to your site or mentioning you, this can tremendously affect your rank. Retweets and Mentions: This directly affects how many times you are linked. Ryan Powszok made a very good post on the anatomy of a retweet. Your retweeted articles will draw that much more traffic to your website and give more authority to your original link. On another note, if 10,000 tweeters mention @lsbranding, this will carry significant weight for rankings. Relevance: Being an authority does not mean your an authority for every single topic. 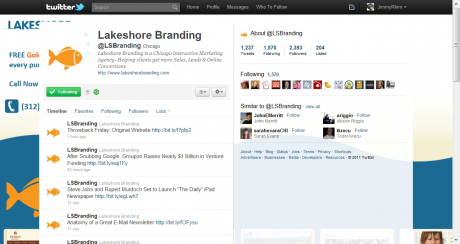 If Lakeshore branding tweeted an article about Lindsay Lohan going to rehab, is that going to have any impact? Or would Perez Hilton tweeting about the difference between ‘301 redirect’ and rel= canonical make any difference? Probably not. Not saying your Twitter should be limited to one topic, but be mindful of what you want to rank for and keep it relevant. ** For more information on using Twitter for Link Building, follow the jump to read another fantastic post from Ryan. I was in college when Facebook was first released. It was a basic social networking tool to connect college students. It was useful for seeing who lived in your dorm, who was in your class, or find your elementary school friends with whom you haven’t seen in years. I remember when it became available to high school students, there was an outcry from the undergraduate community that they lost the exclusivity of Facebook. Well now, Facebook users exceed 500 million users. My mom even has Facebook, and she frequently sends me pictures of our Poodle. Companies have Facebook, your grandparents have Facebook, your baby cousin has Facebook; be it a personal page or a fan page, everyone is on Facebook. Here’s a few tips to make your Facebook page work for your SEO strategy. Use everything we just spoke about regarding Twitter. Quantity and Quality of friends/fans is very important. Also connect your Twitter and Facebook profiles to increase visibility and accessibility. The majority of the time, I see more twitter posts on Facebook because I frequent FB more on my free time. Link Link Link!– A huge facet of best practice link building is to utilize internal linking. While twitter is almost only a ‘wall,’ Facebook pages are entire profiles. 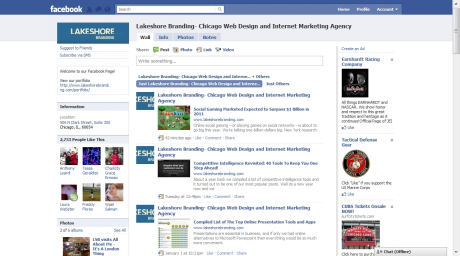 Facebook allows you to link your website, twitter, author bio, blog posts, wherever and whenever. Use your wall liberally to post articles and keep followers updated. Reward– While this is applicable for twitter, it is easier to personally contact your Facebook fans. Give incentives for friending your page and linking your articles, (i.e. some companies give to charity everytime they receive a new fan). Cheat!– There is no shame asking all of your own and your coworkers’ personal networks to like your page and spread the word. The more people see your posts/tweets, the more likely you will drive traffic to your articles. 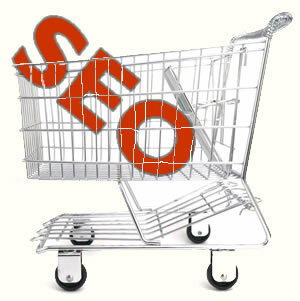 Before you checkout an;d go buck wild with Social Media for your SEO Campaign, there’s a few things to consider . Traffic Jam: Google also has said that load times are a factor in determining your page rank. As you draw more attention to your site via social media you will undoubtedly consume more bandwidth. This will create a couple problems. First of all, the slower load times will cause the search engine spider to move on to quicker faster loading sites. Secondly, the excessive bandwidth can cause your webhost to penalize your service for exceeding bandwidth. Make sure you stay attentive to your bandwidth as you gain spikes in traffic. Mmmm Spam: One of the things I love about Social Media affecting SEO is that spam has no place. People click on links and retweet articles that are interesting and compelling. Fake Twitter accounts or Facebook pages that post bogus articles are usually promptly defriended/unfollowed and reported as spam. That being said, make sure you don’t come off as spammy. DO NOT use bots, or content creators. For best practice social media, be as compelling, genuine, sincere and professional as possible. You’re followers can smell crap better than you think. Frequency: It is good to be active and post a lot of compelling articles, but how much is too much? Too much is when you RT and post so much that anything you write gets pushed down the feed in a few hours. If you have compelling articles, you need to give your people a chance to read them. Much like page rank, an article at the bottom of your feed is exponentially disadvantaged compared to the top entry. That being said , I hope this will be a helpful guide to your SEO campaigns. Any questions, comments, concerns? Feel free to comment. or RT ;-).